Clicktodiscount.com > SendPulse Review – The best multi-channel marketing platform? SendPulse is a marketing app for people with communication demands that are more complex than just an email newsletter app. In this SendPulse review, we will figure out why this app is so popular. SendPulse is a marketing platform that provides you with plenty of options such as a selection of email templates, reporting, a drag, and drop builder. Clients using SendPulse Al regularly see 50% to 100%+ increases in engagement metrics including click-through-rates, page views, time on site and conversions. 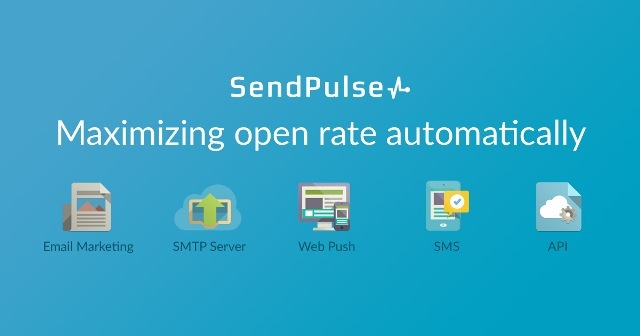 SendPulse is suitable for small and midsize businesses. But is it a good marketing platform to consider using? Let’s read my SendPulse review to find out. Here are some SendPulse main features that I’m going to make clear for you in this SendPulse review. Convenient email editor: The drag and drop email editor allows you to quickly and easily create professional email templates. You don’t need any technical skills or HTML knowledge to create a template. Subscription forms: you can make a unique subscription form using your corporate colors and style. Put it on your site, collect subscribers and send emails to them. Over 130 adaptive templates: Among many templates, find one for any event or activity. It takes up only 10 minutes to create an email. Automation 360: With Automation 360 you can set up email send-out, web push notification and SMS flows depending on variables, events and what your users do. Subscriber rating: Analyze the actions that your subscribers take, segment your mailing list, and use a personal approach to work with them. Personalize your emails: You can easily address your customers by name, inserting any information you have about them in your emails. Set replaceable text fields in your emails based on the information that you have about your receivers. Browser notifications: This is a great way to inform your customers about news, sales, order status, or other important events. Even on smartphones: Send instant notifications to your subscribers’ phones. This is a good solution to get in touch with your customers no matter where they are. Web push automation: Set an automation flow for new subscribers or create automatic messages based on RSS feeds. Personalization and segmentation: With this feature, you can make use of additional user data in notifications. You can also segment your subscribers by their location or other details. 2.3 SMS service: SMS on 800 mobile networks no matter where you are. This is one of my favorite features that I want to mention in this SendPulse.com review. Global reach and fast delivery: Use bulk SMS to raise brand awareness or just send SMS for your personal non-commercial demands. Automated SMS mailing reaches receivers at the speed of 200–500 SMS per second on 800 networks in over 200 countries around the world. Sender name: Use any sender ID depending for your campaign. Sender IDs need to be pre-approved for some countries. Easy-to-setup automation: Bulk SMS sending can be scheduled for a particular time and date. You can also set up gradual sending of SMS over specific time frames. Personalized SMS: Add the receiver’s name and other personal information to each SMS: your name or company’s name, date of birth, discount code, and other. SMS autoresponders: Put the concept of effective communication with customers in practice. Set up an automated flow of messages containing not only SMS but also email and web pushes. Statistics: Check out the results of SMS campaigns by analyzing the statistics on opening and delivering each message you send out. Subscription form: Create SMS subscription forms and integrate them into your website. You can customize the size, the background, font color and even upload your image or logo. Scheduler: Send the message at the time you make the post or postpone it to a later time using the Scheduler. Scheduled messages will be sent out automatically without you having to control it. Message lifetime: The period during which the service will attempt to deliver a message is called the “message lifetime.” It can be set in case the receiver was unavailable at the time you send the message. Dedicated IP addresses: Use a dedicated IP address to increase your sender reputation and avoid blacklisting of your IP due to someone else’s actions. SPF and DKIM records: Show that it’s really your own company and domain sending the message, and minimize the number of messages that are marked spam by using the special cryptographic signatures SPF and DKIM. Reports: SendPulse service creates sending reports and delivery error reports. All reports can be downloaded to your computer. List of unsubscribers: Your mailings won’t be sent to any addresses on the list of recipients who have unsubscribed, even if they are on a mailing list. If you have less than 2500 subscribers you can send up to 15000 emails per month for free. Get the most bang for your buck with a subscription plan that lets you select the number of subscribers and emails you need. If you don’t send many emails, our prepaid email packages give you the option to pay only for the emails you need. If you have more than 1 million subscribers and want to plan a regular mailing program, then contact SendPulse Customer Care Team to get the VIP plan. It does not have an email cleaner built into this software so you have to use an external service. I think SendPulse is a good choice for people who run a small or midsize business. If you’re still thinking about using it or just giving it a try to see if it suits your demands, you could try the free plan first. I hope you like my SendPulse review. Please do not hesitate to share your thought about my review at the comment.